Today, due to changes in construction, engineering, function, architecture, and, crucially, measurement system – which measures functionally all of a ship's internal volume, not just part of it – modern passenger ships' GT values are much higher than their displacements. 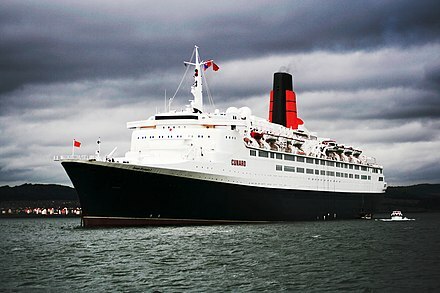 The Cunnard Queens' current successor, the 148,528 GT RMS Queen Mary 2,   has been estimated to only displace approximately 76,000 tons. With the completion in 2009 of the first of the over 225,000 GT Oasis Class dedicated cruise ships, Oasis of the Seas, passenger ships' displacements have finally risen to 100,000 tons,  well less than half their GT. ↑ "Winter 03-04: A Ship for the Sea". Cruise Industry News. Retrieved 2012-05-23. 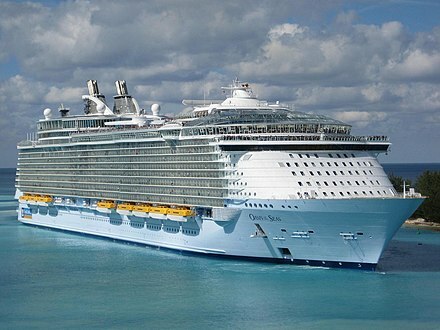 ↑ "Royal Caribbean orders .24B cruise ship - Boston.com". Archived from the original on 20 February 2009. ↑ "Internet Archive Wayback Machine" (PDF). Wayback.archive.org. Retrieved 2012-05-23. ↑ "Glossary, definition of Passenger Space Ratio". Information and Explanations. choosecruising.com. Archived from the original on 2010-08-29. Retrieved 2007-12-28. ↑ "Cruise Ship Tonnage". 123Ttravel.com. Archived from the original on October 11, 2007. Retrieved 2007-12-28. ↑ Titanic's DimensionsTitanic's Dimensions Archived May 27, 2006, at the Wayback Machine . 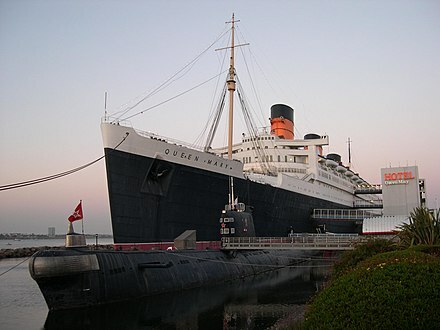 ↑ "Queen Mary Home". Atlanticliners.com. Retrieved 2012-05-23. ↑ "Queen Mary 2 (9241061)" . Ships In Class. Lloyd's Register . Retrieved 2012-07-19. ↑ If Royal Caribbean builds it, 6,400 could come Boston Globe (February 7, 2006). ↑ "A ship is its 'own best lifeboat'". Lloyd's List Australia. 18 January 2012. Retrieved 20 January 2012. ↑ Barry Meier; John Schwartz (February 24, 2013). "Lack of Backup Power Puts Cruise Passengers at the Ocean's Mercy". The New York Times. Retrieved February 25, 2013. ↑ Reinikainen, Kari (2009-05-06). "Fred. Olsen sells Black Prince for further trading". Cruise Business Online. Cruise Media Oy Ltd. Archived from the original on 2009-10-11. Retrieved 2009-05-10. Wikimedia Commons has media related to Passenger ships .